If you’re looking for something unique in an otherwise well-trodden space, the dial-based controls and high levels of customization will make the Microsoft Surface Headphones worth a look. When Microsoft dropped a pair of Surface Headphones in late 2018, it came as somewhat of a surprise. Sure, the line contains plenty of computer peripherals (like the Arc Mouse and the Surface Keyboards), but releasing a pair of premium, noise-canceling headphones at the top of the price range naturally put the headphones in competition with audio-centric brands, which is a tall order for Microsoft. We got our hands on a pair to test in NYC for a couple weeks, and we can say that Microsoft spent a lot of time putting a focus on look, feel, and finish, and though they claim premium sound drivers, we found the audio quality a bit lacking. Here’s how it breaks down. This is arguably the most positive category that the Surface headphones have going for them. There’s a decidedly sleek look about them, with a swoopy headband embossed with a metallic Microsoft logo. The earcups, themselves, are perfect circles measuring about 3.5 inches in diameter on the inside, with a 2.5-inch spinning dial on the outside of each cup. These circles are what make them most unique to our eyes because it’s clear that Microsoft is pulling the look of their Surface dial (used on the ultra-premium Surface Studio products) and incorporating it into the headphones. There is, of course, functionality at play with those dials, but we’ll save that for a later section. The whole construction is virtually the same soft gray, with the only contrast coming from materials (matte vs. metallic vs. plush components). It all comes together in a really pleasing way. The ear cups are a bit bigger than many of the competitors, and because of the way the headband softly bends out to meet the circles, it actually looks pretty sleek and premium when you’re wearing them. At this price point, there are some pretty steep expectations, and the actual feel of a pair of over-ear headphones is often where a lot of the money goes. The Surface Headphones don’t disappoint on the premium side of things: there’s ultra-soft memory foam-esque padding around your ears on each cup, and that foam is covered with a very nice feeling leathery material. That same combo is carried up to the top of the headband along the part that rests on the very top of your head. Microsoft advertises the Surface Headphones as “balanced,” and we can say anecdotally that they do feel very even across your ears when wearing them. But, there are a couple of drawbacks that we think will take a toll on wearers who are settling in for long listening sessions. First, the weight is on the high end, our scales clocked these in at about 10.2 ounces, putting it over a half pound. This might not seem like a lot, but when you compare them to the other options that are often less than 10 ounces (and even less than nine, in many cases), the Surface Headphones clearly didn’t put high priority on weight. Pair that with the odd feeling of having our ears pressed lightly against the mesh that covers the drivers on the inside of the cups, and we aren’t sure these will feel nice during long listening sessions. Again, right when you put them on, the soft materials and comfortable headband will satisfy most listeners right out of the gate, but long-term fatigue seems likely. Microsoft has done a really nice job with these, choosing a really premium-feeling plastic for most of the build, while some of the weaker points with solid metal bracing. The twisting, articulating component that holds the ear cups, for example, feels rock solid, and the metal bracing on the inside of the adjustable band made these feel resilient to bends. Even the twisting ear cup dial controls feel smooth, satisfying, and rugged. All signs point to solid construction, but without any advertised water resistance, and such a short time on the market, the jury is still out on normal wear and tear on components like the foam ear covers and the input jacks. Alongside a comfortable, premium feel, the other top focus of a pair of headphones is, well, how they sound. If you’re spending north of $300, you’ve resigned yourself to purchasing one of the best pairs of headphones in the consumer range. If you buy the Surface Headphones, we can say you won’t be disappointed, but you won’t be blown away either. From a spec standpoint, it’s all there: 20- to 20kHz of frequency coverage, up to 115 decibels (dB) of sound pressure levels (either wired or via Bluetooth), and uniquely engineered 40mm drivers that Microsoft calls Free Edge drivers. The hardware makes the Surface sound like a great set of headphones, but in practice, these just weren’t that special. From a spec standpoint, it’s all there: 20- to 20kHz of frequency coverage, up to 115 dB of sound pressure levels...and uniquely engineered 40mm drivers. The bass was substantial—as expected with 40mm drivers—and there was great dynamic response for full, pop mixes. But the headphones lacked sparkle on the high end, and that ended up being a pretty big detriment to the sound detail. It’s a shame because the added weight seems to imply that Microsoft spent a good amount of time on driver development, but it just didn't wow us. 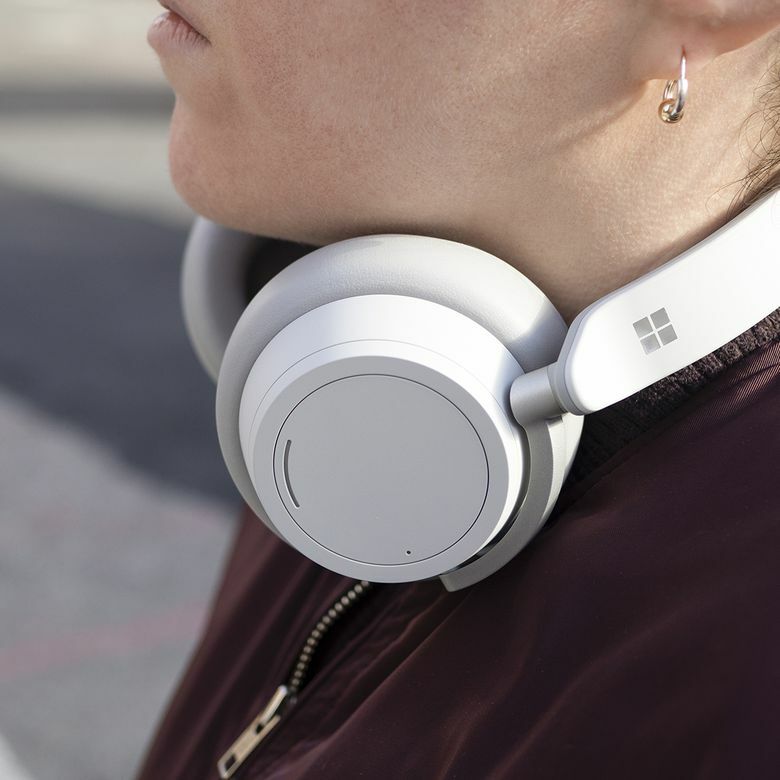 The big selling point for the Surface Headphones—and the feature that Microsoft really hung their release on—is the ability to tailor the noise on these headphones to your exact specifications. Most active noise-canceling headphones give you a binary on/off option for whether you’re employing NC tech or not. Usually, if you want to adjust the amount, it has to be done deep within an accompanying app. Microsoft, on the other hand, gives you the option to control the level of noise-canceling on a sliding scale, just by twisting the physical dial on the left ear cup. The big selling point for the Surface Headphones...is the ability to tailor the noise on these headphones to your exact specifications. Like most other headphones of this class, you can also choose to reverse the process of noise canceling and actually introduce ambient sound, in case you’re in an environment where you need to be aware of your surroundings. The left dial can also be used to mix in this ambient sound on a sliding scale. Think of it as a spectrum: when you twist it a little forward (counter-clockwise), it slowly mixes in more noise canceling, and the opposite is true when you twist it a small amount backward (clockwise). It’s a fun little trick, and for the most part, the noise canceling works very effectively. It’s not class-leading — Microsoft lists the specs at up to 30 dB of suppression with active canceling, and up to 40dB with passive — but the customization and the ease with which you can adjust the dial is virtually unmatched. It’s a welcome addition for those of us who find heavy-handed noise cancelation to be too disorienting, with too detrimental of an effect on sound. Microsoft lists 15 hours as the total amount of listening time available on the Surface Headphones. This is a pretty big disappointment, especially when you compare to competitors that promise 20 to 30 hours of battery life on a single charge. In fact, 15 hours is basically the playtime you’ll get from true wireless earbuds and their battery cases, and those contain much smaller batteries. There is something to be said for being conservative; when we tested we did get the full 15 hours of battery life, even when listening and conducting phone calls. So, perhaps Microsoft has opted for the honest estimate, rather than the “ideal conditions” maximums that a lot of manufacturers list. That said, we would love to see just a bit more juice. There’s one silver lining here: there’s fast charging included, and Microsoft says in at five minutes of charging earning you an extra hour of listening. It’s not the fastest we’ve seen, but it’s nice to see it available. Another nice touch is the battery life reminder you get each time you turn the headphones on, spoken in plain English, ensuring you’ll know when the Surface Headphones need to be charged. Normally we’d devote a whole section to the headphone’s accompanying app, and frankly, at this price point, we were surprised to see that Microsoft didn’t release one dedicated to the Surface Headphones. This is probably because, like Apple’s AirPods, the Surface Headphones are aimed, at least in part, at Windows PC users. If you enable Microsoft’s Swift Pair on your Windows devices, these will pair in a way that’s almost as seamless as AirPods pair to Apple devices. But beyond that, if you’re using these just as Bluetooth headphones, there’s no app support. That is mostly okay, though, because the aforementioned gradual noise canceling dials is accompanied on the right ear cup with a twisting volume control. There are also touch controls on each dial that let you control your music and call up a smart assistant (Cortana is built into the headphones by default, but you can opt for whatever smart assistant your device uses). There’s also a very clear Bluetooth pair button that easily toggles the unit into pair mode. It’s one of the most intuitive packages of onboard controls that we’ve seen. The wireless connectivity of these headphones is, in a word, good. We found virtually no interference or skipping in all our tests, either inside our office or apartment or walking around outside on the street. Microsoft has opted for Bluetooth 4.2 here, which is a bit of a ding when you consider that so many other headphones are opting for Bluetooth 5.0, a newer standard. This is mostly fine as the average user won’t notice, but you’ll get a little less range and stability. Another vexing omission is the fact that Microsoft has chosen not to support more audiophile-centric Bluetooth codecs like AptX or AAC. The marketing materials claim that Microsoft has spent time parsing out how these headphones use the lossiest SBC protocol and polished it up a bit. But at the end of the day SBC is still the lowest quality Bluetooth transmission compression, so you probably won’t get the best wireless sound. With older Bluetooth protocols, a sound quality that won’t satisfy audiophiles, and a slightly cumbersome weight, the Microsoft Surface Headphones are probably too expensive. To be fair, they do feel like Microsoft spent a good deal of time in the construction and manufacturing phases. The build quality is great, the materials feel amazing, and the onboard controls are intuitive, so we can’t say that everyone will be disappointed. To our ears, for this price point, we really wanted to hear crisper, clearer sound. As it stands, they just aren’t inspiring enough for $349.99. Then again, if you like the look, and love your other Surface Products, you’re definitely going to love these. Most shoppers’ first stop in their Bluetooth headphones research with rightfully be the Bose QuietComfort 35s. With top-notch noise-canceling, Bose’s often magical sound quality, and a satisfying build, the QuietComfort 35s sit in a nice comfort zone that the Surface Headphones don’t quite match. But, the level of noise canceling customization on the Surface ‘phones might just pull you in their direction. Another contender is Sony’s WH-1000XM3 headphones. These powerhouses pack in an insane number of features at the same price point as the Surface Headphones, and for our money they probably deliver audio. But, their control set can be a bit clunky, and they don’t have some of the onboard (physical) customization you get with the Surface Headphones, requiring you to pull out your phone and use an app to enable most of the features. Great for Windows users but better options for the price. If you love Surface Products, and you want a stable, solidly built set of headphones to fit into your Windows lifestyle, look no further. But that $349.99 can go a bit further in terms of noise-cancelation if you go for the offerings from Bose or Sony. Product Dimensions 8.03 x 7.68 x 2.25 in.